Edward Payson Guild (b. 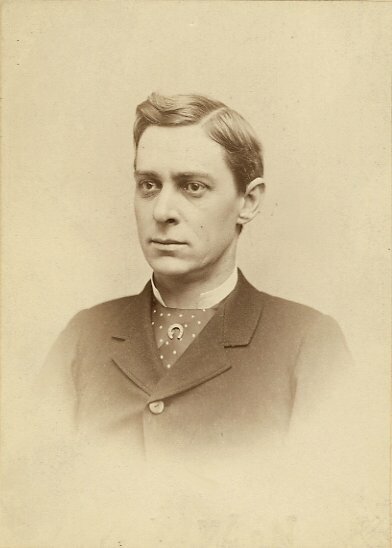 1857) graduated Williston Seminary in 1877. He went on to a long career as an editor for Houghton Mifflin and contributed many articles, often on music, to a variety of magazines. Guild wrote the following memoir for the 1914 senior class yearbook, The Log. 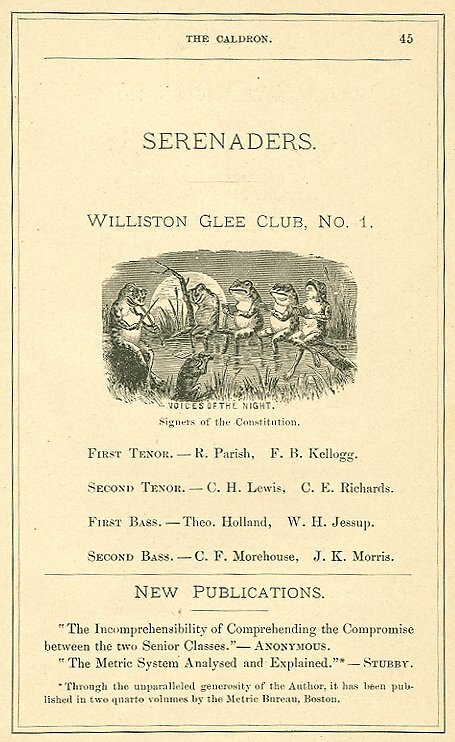 The Williston Musical Association had its birth in the Fall of 1876. It was a natural crystalizing of musical interest which had been growing in the Seminary for some time. 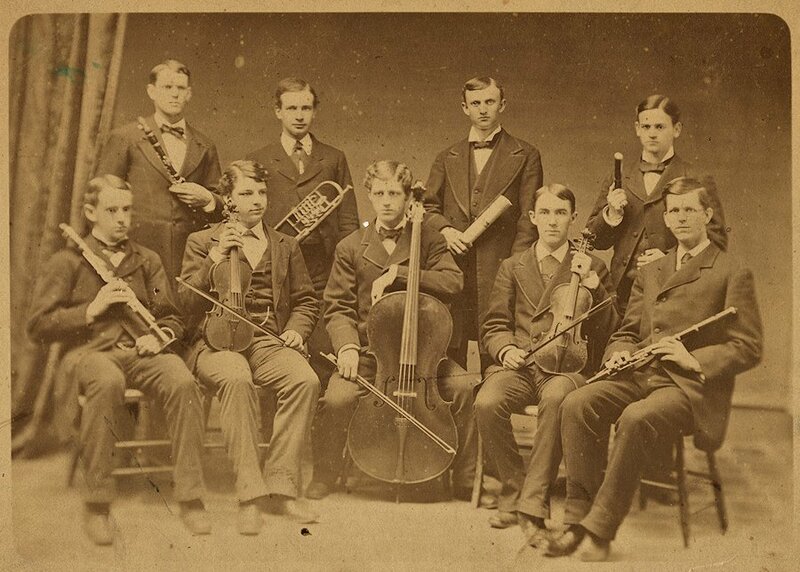 In the previous winter there were several students more or less proficient in playing various instruments but their efforts at harmony had been confined to two or three fellows getting together occasionally and delighting themselves, if not their neighbors, with various instruments, playing college songs, hymns, or anything at hand. The effect sometimes must have been lugubrious, as for instance one Sunday afternoon when I remember some combination of instruments wailing forth over the campus the strains of “Fading, still fading, the last beam is fading.” No doubt more than one listener was anxious that the fading should be more expeditious. One day came, however, when the boys said they would have a real orchestra, and in one of the early weeks of ’76 the first rehearsal took place. The players were as follows: C. H. Lewis, E. H. Sleight, violins; H. S. Ballou, W. H. Harper, flutes; E. P. Guild, L. C. Parkhurst, clarinets; C. H. Norton, cornet; J. F. Woodhull, ‘cello; E. L. Ernhaut, pianist. We had bought some orchestra scores including, I remember, Mendelssohn’s “Wedding March,” Strauss’ “Thousand and One Nights’ Waltz,” a Schottische, and an arrangement of “The Dearest Spot on Earth is Home”; we ordered music stands from Boston — heavy iron affairs — at $3.50 each; the faculty was kindly and granted use of a recitation room for rehearsals. We started off with great enthusiasm, made progress apace, and ere long (proud day it was) received an official invitation to play at a regular meeting of the Adelphi Society.1 Memory does not serve as to just how near we approached the Theodore Thomas standard (we used to run down to Springfield to hear Thomas’ orchestra, then the finest organization in America),2 but it is distinctly in mind that there was enthusiastic applause; whether in compliment to our artistry or to our nerve is not entirely clear. From The Caldron, a senior class annual, 1878. With continued practice the little band improved and soon became a popular institution and the members had a lot of fun in playing, especially for the stag dances at the gym. The organization also included a glee club. Roswell Parish,4 master in the scientific department, was an enthusiastic musician who gave much encouragement to our work. He was made an honorary member of the Association and was leader of the glee club, whose other members were F. B. Kellogg, C. H. Lewis, Theodore Holland, C. A. Twichell, H. S. Ballou, L. C. Hay. The voices were all excellent and the club sang with fine effect. About the same individuals composed the Chapel choir with Guild organist. As the year went along the orchestra became increasingly ambitious and all the students seemed to take a good deal of pride in it. Kellogg, a new man that year, an accomplished violinist, was an efficient leader. 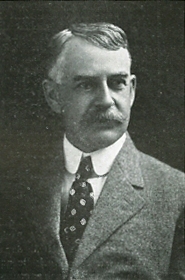 W. E. Semple was pianist for the orchestra and glee club. For a while [William] Peck used a double bass hired at Northampton but later sent home to Connecticut for his own instrument. It was expected to arrive on a certain train and most of the students were at the station waiting. The train drew in, the baggage car opened, and a tremendous cheer went up as the big viol was tenderly lifted to the platform. Then with it borne on willing shoulders like a returning hero the procession started up the street to the Seminary. 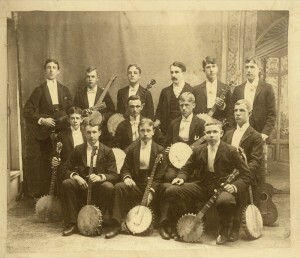 A string band from 1892. Banjos were wildly popular late in the century. For the prize speaking in Payson Church that term, the new orchestra was engaged to furnish music. In the choir loft of that edifice we might find inspiration from the genius of the venerable noted organist, George Kingsley, composer of many standard church tunes.5 We used to listen with admiration to his playing at Sunday morning services and note with interest the care with which his always attentive daughter placed the long, heavy cloak over his shoulders as he finished his performance. So we accepted with pride and confidence the invitation and rehearsed with increased ardor. It was necessary to secure a cornetist from an outside source for that evening and Guild made a sudden trip to Northampton without pausing for the usual formalities. On his return he reported to Master Parish. We played in our very best style that night and received many compliments. One of our pieces, quoted from memory, was Selections from “I Puritani,” Bellini. 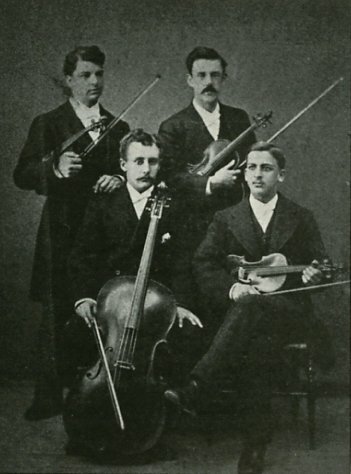 The String Quartet of 1877-78. The string quartet section of the orchestra worked up some fine music by themselves and in the Spring vacation, I think it was, gave several concerts in various towns with gratifying success. Thus was the first year of the Williston Musical Association. It came into existence because a number of the boys felt an impulse to get together for mutual joy in music, but without very definite plans for future years. To us original members it is certainly gratifying to know that now, more than a third of a century later, the Williston Musical Association is a firmly established, flourishing organization. 1Adelphi was the older of Williston Seminary’s two debating and literary societies. 2Violinist and conductor Theodore Thomas (1835-1905) eventually became the founding music director of the Chicago Symphony Orchestra. 3The Mirror was a magazine published from 1869-1882 by the Gamma Sigma Society, Williston’s other literary and debating organization, the bitter rivals of Adelphi. 4Roswell Parish taught Physics and Chemistry and led Williston’s choral groups from 1876 to 1882. 5Northampton native George Kingsley (1811-1884) composed many standard hymns and compiled a number of popular hymnals between 1832 and 1865. He is principally associated with the Old South and Hollis Street Churches in Boston, and Girard College in Philadelphia. We welcome your comments and questions! Please use the reply form below. Fascinating history! I particularly enjoyed the dialogue between Student Guild and Master Parish on Guild’s return from his cornetist search in NoHo! Thanks for sharing.